These 12V workhorses have proven to be the most reliable pumps we've reviewed. These are ideal for mobile use, temporary battery-powered aeration in remote locations, emergency aeration during power failures or as the solar powered pump to ensure there are no fish losses. They are oilless with ball bearing construction and low amperage draw. Make sure your battery system amperage is compatible with the amperage draw of the air pump, see the chart below. 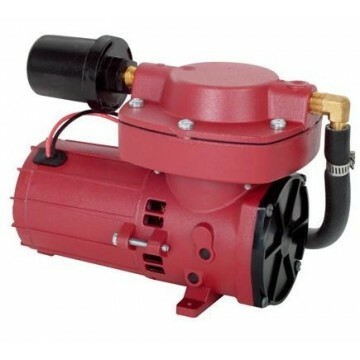 Made in the USA these diaphragm pumps are long lasting and come with a 6 month warranty. Replaceable diaphragms and diaphragm repair kits make this low maintenance and allows you to keep the pump running for thousands of hours. Normally the brushes will need to be replaced after around 3,000 hours of usage. The compressor will run for about 6 hours off a regular car or truck battery. If you have a solar charger for a battery you can easily build your own solar aerator. The low-cost of the pumps makes it affordable to use several of the units in larger ponds to provide thorough airiation in all regions of the lake or pond. Could operate from one to three diffusers in a 12 foot pond. Ensure the diffusers and tubing used do not create un-wanted back-pressure to ensure longevity of the compressor.Building a solar lake aerator isn't that difficicult if you start with a solid and reliable battery powered air compressor. These 12V workhorses have proven to be the most reliable pumps we've reviewed. These are ideal for mobile use, temporary battery-powered aeration in remote locations, emergency aeration during power failures or as the solar powered pump to ensure there are no fish losses. Six Month Warranty. Made in the USA. Please ensure you know what you're doing with these 12V direct current compressors. We are not responsible for faulty installations nor can we offer design assistance. Battery aeration systems require diffusers to function efficiently and it is important to ensure your diffusers or airstones are getting the correct CFM of airflow to operate and to include any pressure loss and due to rubing lengths and diffuser back pressure. Understand the amperage draw requirements of the pump before purchasing to ensure functionality with your battery system. Starting amps can be twice the average running amps. Consult with your local solar parts supplier or technician to ensure everything will operate according to your plans and desires.